Monday morning in London and there is another tube strike. I’m one of the lucky ones who didn’t have to try and fight my way through the crowded buses to work but I did need to get to the Street Kitchen in Covent Garden. I wasn’t going to let TFL stop me, so I started to walk and let’s face it, I could do with the exercise. Covent Garden was home to a large food market until 1964 when it was moved to Vauxhall as the New Covent Garden Market. It was nice to see the van start the journey in a place that was once a great British market. The two chefs behind the Street Kitchen, Jun Tanaka (head chef at Pearl) and Mark Jankel are very passionate about UK produce. During London Restaurant Festival the two guys decided they would come out of the kitchens and get amongst the people of London. They have certainly done their research too. They have gone to alot of effort to serve ONLY food grown in the UK. Their menu is governed by what is available from the growers and may change accordingly. They haven’t even used any pepper because they couldn’t source it from a UK grower. How that’s for lunch! 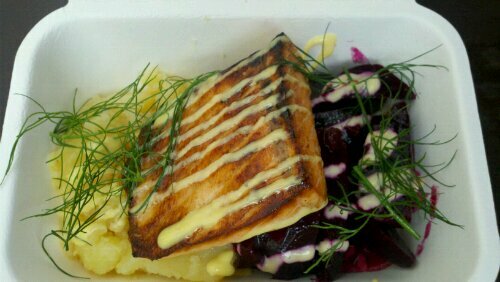 Hot smoked salmon with beetroot, crushed potato and horseradish. It’s not cheap at £6.50 but it was a pretty large portion of Loch Duart salmon, and it certainly delivered on taste. You know I would rather spend more and know I’m going to eat quality food, supporting British growers than spend less and eat tasteless imported food with a huge carbon footprint. That brings me to the packaging. Sourced from a British company but made in Asia. Mark Jankel was telling us how he had to choose between plastic recyclable containers or biodegradable ones, taking into account the carbon footprint for recycling and manufacturing. He chose biodegradable. This is all part of the journey he is taking with The Food Initiative, through which he will open a restaurant early next year with the same ethos. 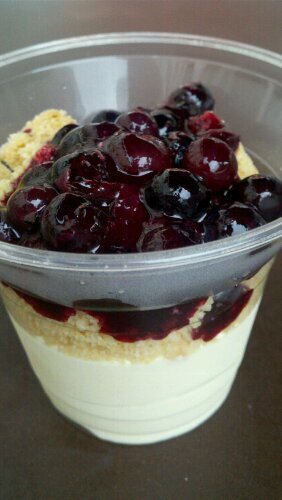 Dessert was a delicious vanilla cheesecake with a compote of blueberries. The berries were delicious! I’m really behind these guys who could sit comfortably behind a restaurant kitchen but they are passionate about UK food and want to spread the word! 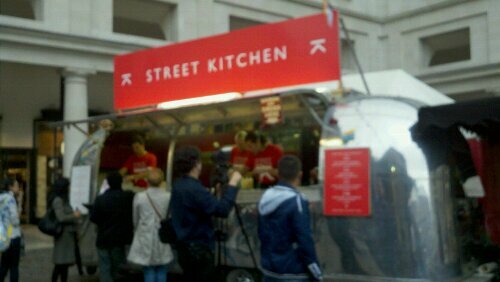 Street Kitchen is open for the London Restaurant Festival (4th-18th October). Covent Garden from 4th-10th October and finishing in Spitalfields, 15th-18th October. 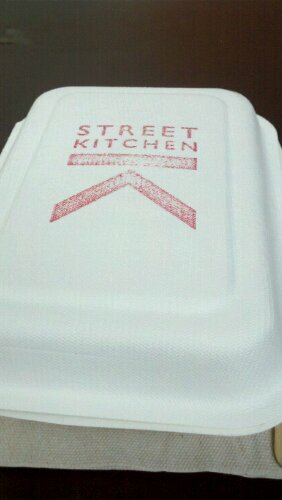 Ms Macaroon was invited as a guest of Street Kitchen and all photos in this post were taken with my Motorola Milestone XT720.